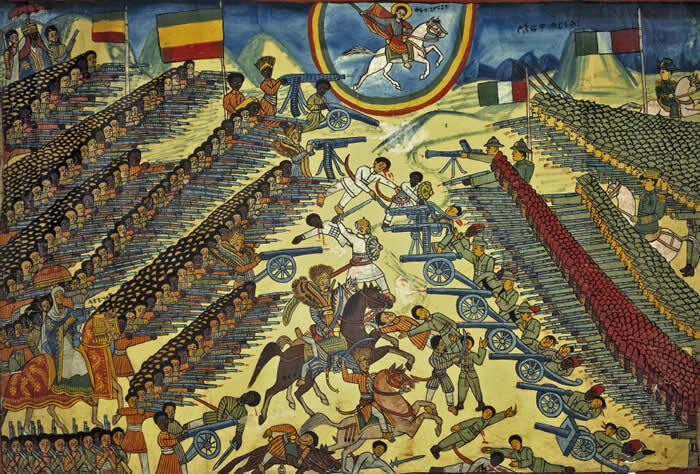 Painting commemorating the Battle of Adwa, Catalogue No. E261845-0, Department of Anthropology, NMNH, Smithsonian Institution. The Battle of Adwa, painting by an unknown Ethiopian artist. The painting depicts the Battle of Adwa, fought between Italy and Abyssinia in 1896.
the best thing .this is what we need to celebrate not once in a year but everyday .we have to now the favor our fore fathers and mothers do for us. they pay for us their blood so that we live with freedom but we betrayed them by forgetting their scarification for us. dess yelal! tarik seree mahiber bemaggntachen egziabher yemesgen!!! Thanks for the share!!! really interesting and wakeup call! Thank you for presenting this reading. it so fascinating and attractive reading. Mahiber Kidusan is working excellent job for the country and our Orthodox church God bless them. As Diakon said the Mother Orthodox Church is lost her power becouse we pushed indirectly to lose our history, however Mahiber Kidusan is doing right to regaing our history. Keepgoing!!! Great job MK Tinat Maekel! you are waking up all of us who are slept on our fathers precious sacrifice. keep it up everybody including gov't will follow bahind you. It is really this we have been expecting from you to teach the new generation and encloth him his fathers' victorious trouser. No words to thank you. However, I want to add one historical point in your article. one of the Italian head said," we are not defeated by Ethiopians but by St. George"
I think this may be the reason why Erupeans are trying to destroy our Gedls through protestantism. How much they are foolish! Do they believe by burning Gedls, Saints like Giorgis will also be too? `really thank you MK!!! may God help you in all your works!!! Even now, there are few Ethiopians who do not accept this history because the circumstance was performed at Alaje, Mekele and Adwa or in Tigray places. But the main issue that must be awared is, who were the fighters in Alaje, Mekelle and Adwa? All Ethiopians(christians and muslims) who were under king Menik had participated in banishing the invaders. MK ahun sirachun yagagnachu meselegne, lelawn ezam ezhim titachu wadzi bitazanabilu bizu tisaralachu! Interesting read. we should start looking inward. Interesting read. Due to utter unconsiousness our generation has become vulnerable to the false notion of "modernity." We have become unconsious enough to realize that "modernity" is nothing otherthan the cultural invasion strategy with political and economic motive. Ironically, this project has got champions in the religious and political institutions in Ethiopia. The "modern" youth is bemocing more attached to the "modern world" ,the "modern" youth knows every little detail about personalities in the Hollywood world and about people who are projected as a "success" stroy in various Media. Yet, knows little about his own country and what the Ethiopian generation of the late 19th century paid for to maintain Ethiopian Independence. Articles like these are essential in challenging the false notion of modernity. "እውነተኛ ታሪክ እና በታሪክ አስታክኮ የለበጣ ኢትዮጵያዊነትን መግለጥ እጅግ የተራራቁ ጉዳዮች ናቸው የሚገርመው በአካባቢየ ከማውቃቸው በርካታ አርበኞች መካከል አንድ እንኳ ሙስሊም የለም..."
Though I am muslim I have right to participate if there is national issue in your blog. You seem as if you know history but nothing. See, 1) ethiopian muslims and Akararian of Jimma are absolutely different but you are generalizing us like as though "Oromo=ONEG"
Let me ask you, Do you believe if very few orthodox people did bad movement-against muslim as one day was happened in Gonder, all Orthodox followers did? 2) As it is said in the article, Italian soldiers had been firstly defeated at Alaje by the people of Addisho, Wajrat, and Raya. Therefore, starting the time of Gragn Ahmad most of Raya people are muslim who always defeated our enemies not only in Alaje, Mekele and Adwa battle but also in every ethiopian historical places has the first name. But I don't mean Raya is the only ethiopian hero people. 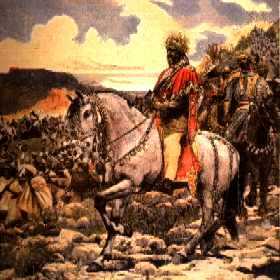 As a "Historian" it is shame to say "muslims of Raya defeated Italy at Adwa" - It is a novel history for Ethiopia. Please read carefully what I wrote. 3) don't look muslims they had not played roles in ethiopian history. 4) Don't see Ethiopian muslims as if they are minority part because of movement of few immigrant akrarians-catalysts who are sent from Arab not for expansion of muslim religion but for their own business. Do you know their secrecy? it is , if ethiopia starts to search petrolem arround..., Arab's petrolem will be deteriorated, because of the geographical location. Generally, be out of the box!